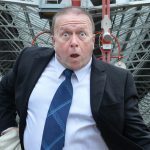 Whether he’s repeatedly banging his tin helmet in time to wartime songs, making a sheer mockery of morris dancing or simply running amok amongst the audience Pat Cahill is proud to represent the daft faction of the comedy scene. Pat’s style of “controlled silliness” has led to multiple TV and radio appearances. and 2016 saw him nominated for Best Show at the Leicester Comedy Festival. Steve Gribbin is a guitar totin, politician smotin’, small and burly, short and curly, pumped up, loved up, finger pickin’, arse kickin musical comedy imp! Steve combines razor sharp lyrics with tunes that put their foot in the door of your mind and refuse to leave. 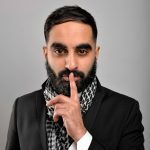 And your compere for the evening is Blackburn’s Tez Ilyas. Tez has now made numerous TV appearances in addition to creating and performing in comedy shorts for both the BBC and Sky. 2017 sees Tez take his first UK tour on the road.